All you need in just one night! Classes are held at my home in South Meridian. 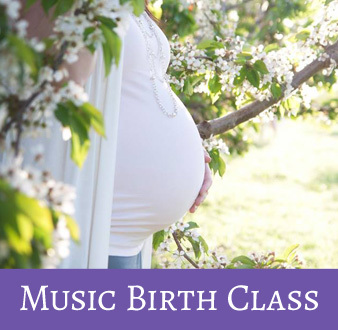 Class tuition includes 3 hours of professional instruction, one copy of my book The Sacred Gift of Childbirth: Making Empowered Choices for You and Your Baby, Music Birth Class Manual, Playlist sample CD and Imagery practice CD. Private, in-home classes are also available for $150. “It was the most engaging, insightful and fun class I’ve been to in quite some time. Both my husband and I were blown away.” Sarah N.
“I have had five children– four naturally, and have taken three different childbirth classes that included a variety of approaches to birthing– some that were helpful, and some that were not. Marie’s approach includes relaxation, massage, and preparation– all things that I have found to be key to comfort in labor. The thing that sets Marie’s classes apart from any others is the addition of music. Marie teaches how the use of music in preparing for childbirth can actually provide your body with a cue as to how it should respond at each stage of labor. Anyone who has been through natural childbirth knows it can be done, but that it can be very difficult to remain in control enough to relax in response to the intensity of contractions. Marie provides a powerful way to help your body maintain the control that is necessary for birth to be the amazing miracle it was intended to be.” Amber D.
“I DID IT WITHOUT ANY DRUGS!!! Completely natural birth! The music was insanely helpful! I listened to the transition music for much of the process, and we enjoyed the lullabies afterward. I just wanted to thank you for all you did. Your class gave me the information I needed to prepare for birth, and the techniques to make sure it was natural. Had I not taken your class, I would have likely had pain medications that would have been useless and harmful. Additionally, because I had a natural birth, I was able to be by my baby’s side at all times while she was in the NICU. Thank you thank you thank you!” Katie J.